Undeniably adorable, Latitude Adjustment Beach House is a celebration of authentic coastal North Carolina cottage-style island living. 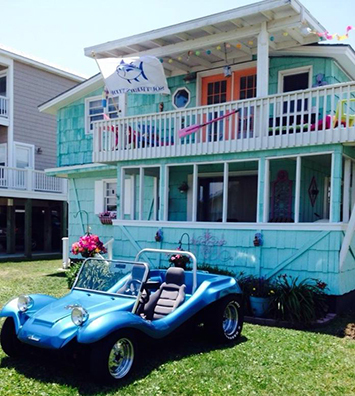 Located on Pleasure Island, home to Kure and Carolina Beach, the house has been lovingly decorated with nostalgic beachy charm and a touch of Caribbean flair. Latitude Adjustment offers a relaxing coastal experience where visitors may enjoy cool summer afternoons with friends and family. A lazy, 28 second stroll finds your feet in the sand as you take in the spectacular views of the Atlantic ocean. Just 20 minutes from Wilmington, this seaside cottage features two units available as vacation rentals – 3 bedrooms and 1 bath upstairs and 2 bedrooms and 1 bath downstairs – each providing the perfect beach getaway.